The ISRA is taking an active representation in the following events. Submit your event at which a Region Rep, Board Director or Officer will be present to represent the ISRA - that event will be added with approval of the Reps, Directors and/or Officers. The ISRA will be represented at the annual 500 World of Wheels event February 12,13 and 14, 2016 in the usual location in the Blue Ribbon Pavilion, Indiana State Fairgrounds. Fabulous cars from your past! Classic Car Show presented by the 9th Street Gang Car Club. Rain or Shine event. Street Rods, Classics, Muscle Cars and special interest cars. Cash drawings, prizes, awards. Awards presentation at 3pm. Proceeds benefit local charities and community programs. Please Join Us on June 18, 2016, in Flora, Indiana. We will be hosting a 10k run, 2-mile walk, and 500-meter runt jog for kids age 2-7. FREE pork burgers are back!? All participants will receive a free HOT Pork Burger sandwich. ENTRY TO PARK ON DAY 1 (SATURDAY) INCLUDED IN ENTRY FEE. 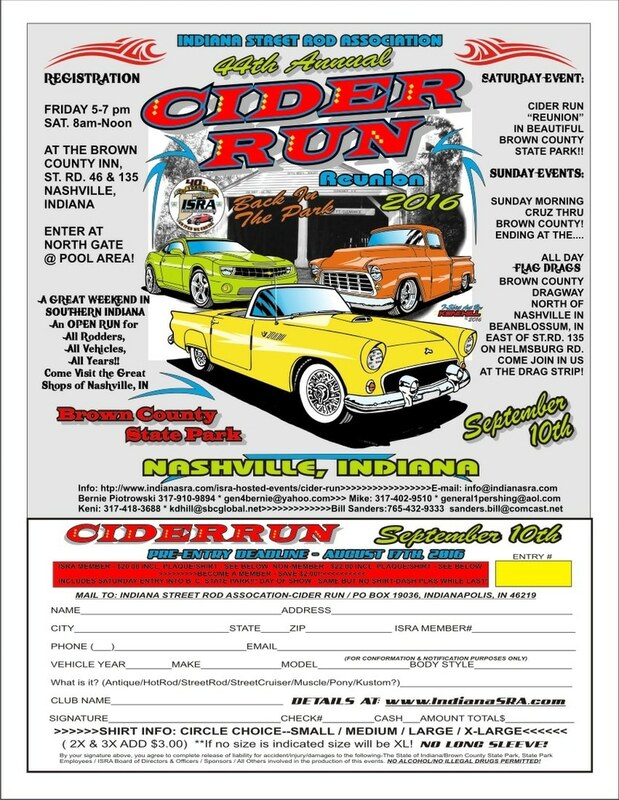 REGISTRATION AT BROWN COUNTY INN AT SR 46 AND SR 135, NASHVILLE,IN. REG. TIMES FRI 5 –- 7PM / SAT 8 –- 12 NOON. MEMBERS $20.00 / NON-MEMBERS $22.00 (Includes State Park Entry Fee. 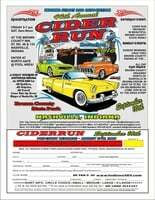 THIS IS THE CIDER RUN NUMBER 44! PLAN TO BE THERE WITH ALL YOUR ISRA BUDS! September 23 - September 25 - Hosted by the 9th Street Gang - Playacres Park, Fairmount, IN. Sponsored by the Fairmount Historical Museum annually, this event includes a huge car show featuring 50’s classic and custom autos. Parade of Neon, special guests, swap meet, and plenty of 50’s entertainment! James Dean look-alike contest, 50’s dance contest, 5k walk, Pet Parade, and showings of Dean’s three films. $200. Pre-Entry Cash Drawing, (Do Not Need To Be Present To Win, Also 5 Other Cash Drawings, $100./$50./$50./$50./$50. Day of Show! Thanks for coming to Richmond for the 2015 Show!!! 44th Annual Vintage Wheels Rod & Custom Car Show inside the heated Raper building at the Wayne County Fairgrounds Complex, 861 North Salisbury Rd. Saturday 9am-8pm, Sunday 10am-4pm, awards at 3pm. D.J., awards, door prizes, 50/50, auction, food available, vendors.